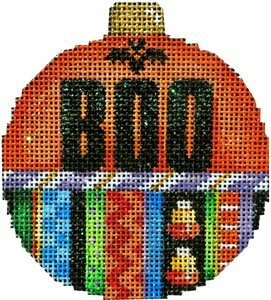 This Halloween needlepoint design called Boo mini ball is handpainted onto 18 mesh Mono Zweigart needlepoint canvas and is easy to stitch. The design area measures 3" x 3.5". 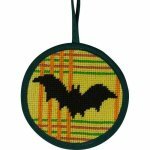 This Associated Talents Halloween needlepoint design is sold canvas-only or with fibers. if you select cotton we will send DMC stranded floss; bella lusso for wool and Pepper pot single stranded fibers for silks. If you need stretcher bars we recommend one pair of 7" bars and some thumb tacks. 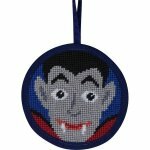 This halloween needlepoint Boo mini ball canvas usually ships within 7 days. If for some reason there is a delay we will let you know. Contact us if you have any questions about this Boo needlepoint canvas. We are always glad to help.